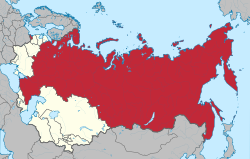 On January 19, 1918, there was a briefly existence of the Russian Democratic Federative Republic, but actual sovereingty was still in hands of the Soviets even after the Russian Constituent Assembly opens its first and last session. Orile-ede Olominira Apapo Sofieti Sosialisti Rosia (Rọ́síà: Росси́йская Сове́тская Федерати́вная Социалисти́ческая Респу́блика (РСФСР), Rossiyskaya Sovetskaya Federativnaya Sotsialisticheskaya Respublika [RSFSR]), tabi Orile-ede Olominira Pipapo Sofiti Sosialisti Rosia, Russian SFSR, ati RSFSR ni soki, ni orile-ede olominira Sofieti totobijulo ati toni iye eniyan julo ninu Isokan Sofieti. ↑ Riasanovsky, Nicholas (2000). A History of Russia (sixth edition). Oxford University Press. pp. 458. ISBN 0-19-512179-1. Àtunṣe ojúewé yi gbẹ̀yìn wáyé ni ọjọ́ 12 Oṣù Kẹ̀sán 2018, ni ago 06:16.